TOKYO – Asian shares stumbled on Friday and emerging market currencies skidded as investors feared higher interest rates under incoming President Donald Trump will spark capital outflows from the region. MSCI’s broadest index of Asia-Pacific shares outside Japan .MIAPJ0000PUS fell 1.4 percent as US bond yields continued to soar on views that Trump’s spending plans will push up inflation, possibly triggering more aggressive rate hikes by the Federal Reserve. Emerging markets bore the brunt of selling, with Indonesian shares slumping 3 percent while the rupiah currency fell more than 2.5 percent to 4-1/2-month lows. The Mexico peso, sank to near its record low hit after Trump’s surprise sweep to power. Japan’s Nikkei bucked the trend, rising more than 1 percent to 6-1/2-month highs the yen weakened against the firming dollar. On Wall Street, the US S&P 500 Index rose 0.2 percent while the Dow Jones industrial average jumped 1.2 percent, smashing through its previous record high set in August by almost 1 percent. In contrast, the technology-heavy Nasdaq fell 0.8 percent, with Apple APPL.O dropping 2.8 percent, hit by fears that Trump’s immigration policy could prevent Silicon Valley from attracting talent from around the world as it does now. “The market’s focus has shifted to Trump’s policy after the initial knee-jerk risk-off reaction. The markets think he is likely to protect the U.S. domestic economy, especially the old economy,” said Koichi Yoshikawa, executive director of financial markets at Standard Chartered Bank. “That explains why the Dow was up and the Nasdaq was weak,” he added. The financial sector .SPSY surged 3.7 percent to its highest since the 2008 global financial crisis, as Trump has sided with leading conservatives in calling for the repeal of the 2010 Dodd-Frank Financial Reform Act largely opposed by banks. US bond markets have also seen dramatic moves since Trump’s victory, with the 10-year US Treasury yield hitting their highest levels in 10 months. Expectations that his policy stance – from protectionism and fiscal expansion – will boost inflation have been driving the surge in US yields. “You have fiscal policy that will widen the deficit by trillions of dollars in a decade, and if there’s a 20 percent tariff on imports from China, that alone would boost inflation by one percentage point,” said Tomoaki Shishido, fixed income analyst at Nomura Securities. The 10-year US yield rose to 2.15 percent, almost 30 basis points, or 0.30 percentage point, above its levels around 1.86 percent just before the US election on Tuesday. The 30-year yield rose 38 basis points, posting its biggest weekly jump since 2009 before a US market holiday on Friday. Soaring US yields have been a boon to dollar bulls. The euro dipped to $1.0908, compared to $1.1025 before the US elections. The dollar strengthened sharply against the yen, which has traditionally a strong inverse correlation with US yields because higher US yields encourage Japanese investors to buy more US debt. The dollar rose to as high as 106.95 yen, its highest since late July, compared to around 105.15 yen before the elections. 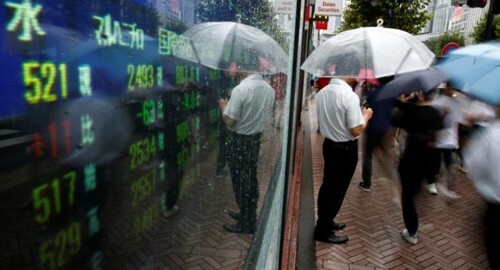 It eased back to 106.38 yen on Friday. However, emerging market currencies were hammered by concerns investors could pull back their funds out of higher-yielding emerging assets and move them back to the US. Apart from the Indonesian rupiah, the Mexico peso has fallen 7.5 percent so far this week, hit by Trump’s threat to scrap the country’s key free trade agreement with the United States and build a massive wall along the border. The Brazilian real shed 5 percent on Thursday to a five-month low, while its benchmark Bovespa stock index slumped 3.3 percent. The South Korean won fell to its lowest level in more than four months on the dollar’s strength and concerns about Trump’s foreign policy and his commitment to security in East Asia. Markets are expecting the US Federal Reserve to go ahead with a rate hike in December afer US markets quickly stabilised from the initial Trump election shock. The money market futures FFZ6 FFF7 are pricing in about 75 percent chance of a rate hike. In a remarkable shift of sentiment, the market is also now starting to price in a chance of a rate hike by the European Central Bank for the first time since 2011.